How do I create a teacher import file? Importing teachers allows an administrator to bulk create teacher accounts. You must create teacher accounts before you will be able to setup classes. The teacher accounts you create will be the accounts that the teachers in your school will utilize to access Sadlier Connect. This article will go through the steps required to create the actual teacher import file. Log into Sadlier Connect with your school administrator account. Select Manage Teachers from the setting menu. This is located in the lower right-hand corner of your screen. It is the icon with the two people with a gear between them. 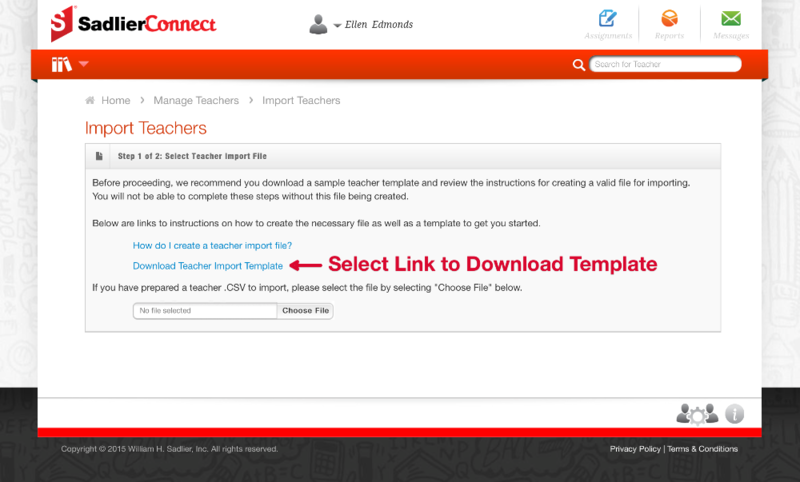 Select the link Download Teacher Import Template and save it to your computer. Remember where you save the template file on your computer as you will need it in a couple of steps. 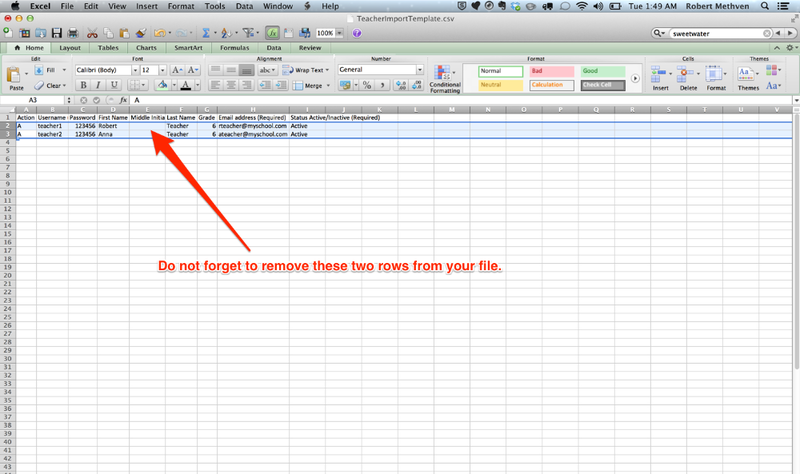 The file will be named TeacherImportTemplate.csv unless you change the name when saving the file to your computer. 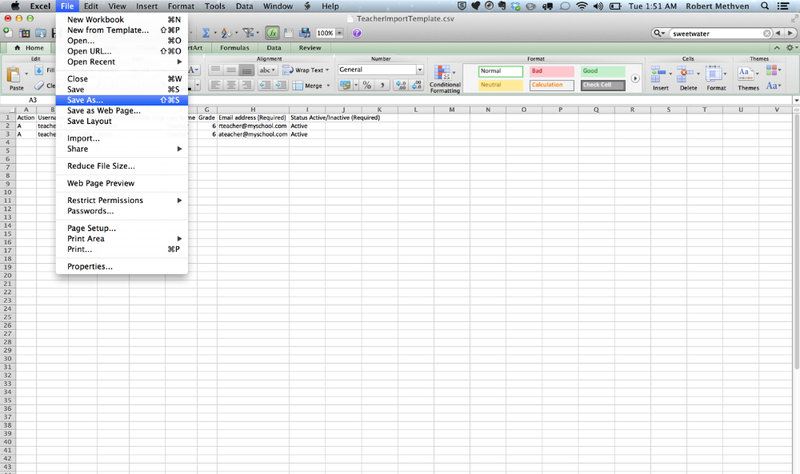 Open up Microsoft Excel or a similar spreadsheet application. Select File > Open from the menu within Microsoft Excel. Select TeacherImportTemplate.csv from where you saved it on your computer. If you saved the file as a different name, then open the file you saved in Step 3 above. You can expand the widths of the columns. When you do you will see (Required) and (Optional) indicators after the column names indicating which columns are required and which are optional. See the Import File Column Information below for a list of the fields, descriptions, and acceptable values. You should delete the two sample teacher rows provided when you are done so that these teachers are not created in your account. 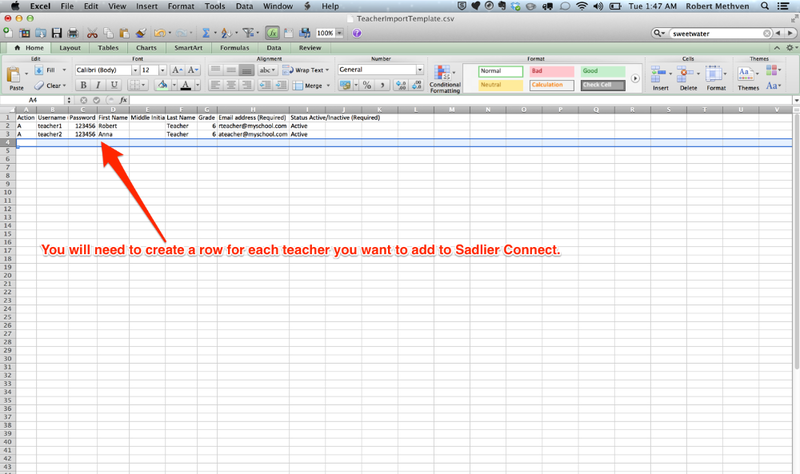 You will need to add a row for each teacher account you need to create in Sadlier Connect. You will want to change the filename so you do not overwrite the template file that you have downloaded. You must save the file in a Comma Separated Values (.csv) file format. It is critical that you select the correct file format, Comma Separated Values (.csv) when saving your file. 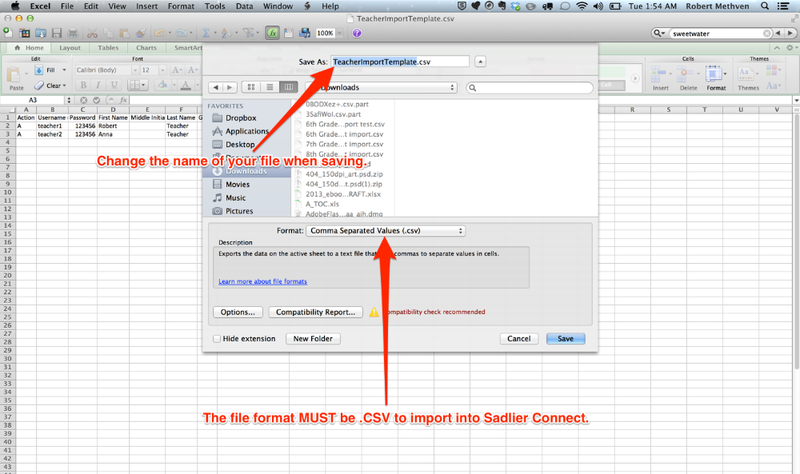 Failure to do so will generate a file that will not be able to be processed by Sadlier Connect. 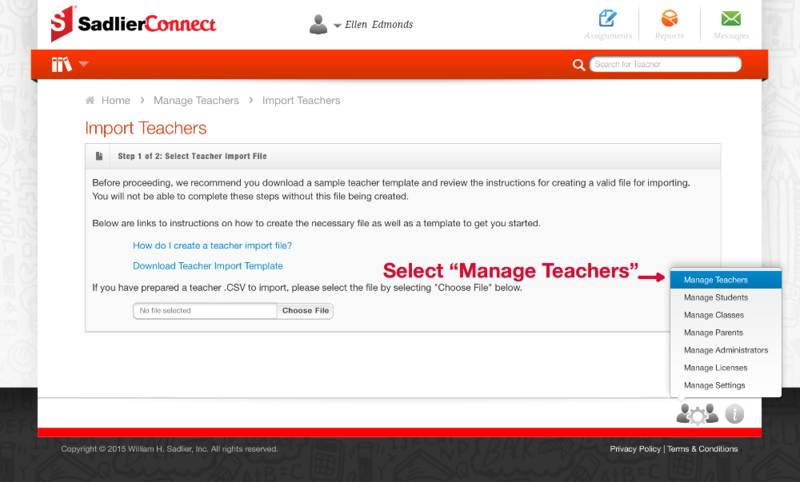 You now have a teacher import file that is ready be uploaded to Sadlier Connect. "How do I import a teacher import file?". Column A - Action (Required): This column tells the system what it should attempt to do with the row of data in the file. The value "A" should be used when trying to add a teacher account to the system. One would set to this value for the first time the teachers are being uploaded into Sadlier Connect™. The value "U" should be used when you want to update an existing teacher account in the system. Column B - Unique User ID (Optional): You will not need to provide a value in this field. This field allows you keep a unique identifier for the user account if the data is coming from another system. Column C - School PID (Optional - District Only): You will not provide a value in this field. Column D - Username (Required): You must supply a username for each teacher in your import file. Your usernames are unique to your school organization, so you will not encounter the issue that the username has been used by someone else and you cannot use it. Typically, the username is the teacher's first initial followed by their last name. You can use whatever convention you desire, though it is recommended to be consistent convention across usernames. The username provided in this column will be what the teacher uses to log in to Sadlier Connect™. Column E - Password (Required): You must supply a password for each teacher in your import file. It is recommended you follow good practices in creating passwords and not use common passwords. Teachers have the ability to change the password of their account. Column F - First Name (Required): You must provide a value in this field for each teacher account you want to create in the system. Column G - Middle Initial (Optional): You can provide the school teacher's middle name or initial in this field. Column H - Last Name (Required): You must provide a value in this field for each teacher account you want to create in the system. Column I - Grade (Optional): It is informational for teacher accounts. The acceptable values are: K, 1, 2, 3, 4, 5, 6, 7, 8, 9, 10, 11, and 12. Column J - Email address (Required): You will be required to provide an email address for teachers. The email address must be unique for the teacher. It is recommended that you use the school-provided e- mail address for teacher accounts. This email address is only used for system notifications as well as to allow teachers to recover their password should they forget it. Column K - Status Active/Inactive (Required): It is a required field though if not provided the system will use the value "Active". This means that the teacher account will be activated or enabled within the system. The value "Inactive" can be used to inactivate or disable an account. When an account is disabled the user will no longer be able to log into the system. You must not change the order of the fields provided in the template. You must use the acceptable values for columns where a list of acceptable values is provided. You must provide the required columns for each teacher included in the import file.